The recording sounds like a bird in distress followed by rapid peregrine “kakking.” It’s an audio scarecrow. Pittsburgh’s winter crow flock has decided to roost in Oakland bringing at least 4,000 crows into the trees on campus. Every morning the sidewalks are a gooey smelly mess. Here’s what the Fifth Avenue sidewalk looked like on November 14 (photo by Claire Staples). Pitt aggressive bird sounds screaming out at different locations in sequence. Crows settling elsewhere but still on campus. 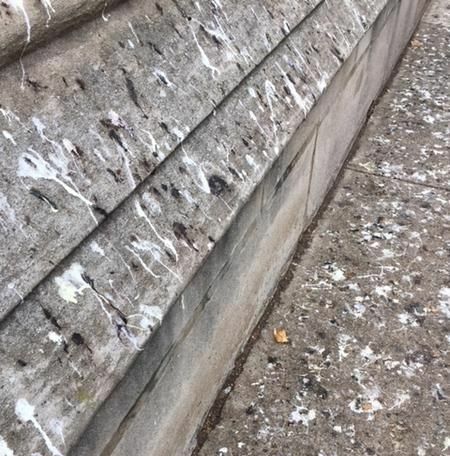 I’ve found crow evidence below the London plane trees by Carnegie Library, the Pittsburgh Public Schools office and St. Nicholas Cathedral. The crows have moved — but only across the street. They’ve already figured out the scarecrow. It’s annoyingly loud but not scary. p.s. Why does the flock like to roost at Pitt? Look how well lit the area is at night (photo at top)! Crows like to sleep in tall trees where the lights are on. 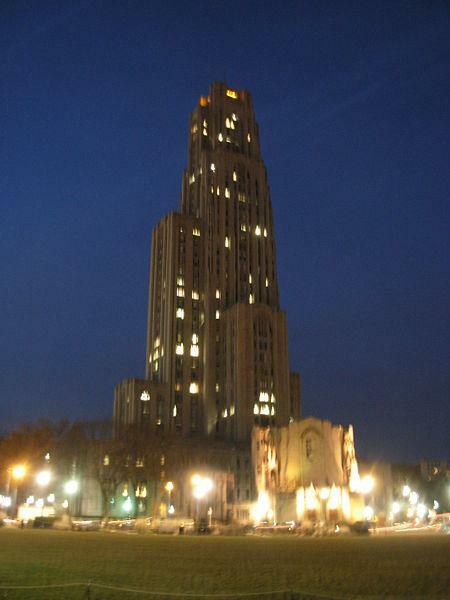 Will the sounds of a Peregrine being played around the Cathedral of Learning bother Hope and Terzo? Mary Ann, I don’t know if the sounds bother them. It happens every November so they’ve heard it before. 1) Crows are intelligent. Could some of the 2013 veterans be remembering that those noises were just noises and not dangerous? 2) If the crows are moved to Soldiers and Sailors Hall, or some other nearby place, wouldn’t the folks at those places be annoyed? Too bad the crows couldn’t be persuaded to move to Schenley Park or some other place less of a nuisance. Yes, crows are very smart. They distinguish one person from another and they know who you are and whether you are good or bad (just like Santa). A fake bird cry will not fool them. More likely they moved down the street because the noise was annoying to them, just as it is to us.